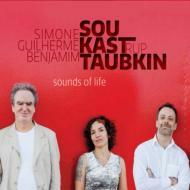 Release from this trio featuring Benjamin Taubkin, Simone Sou and Guilherme Kastrup. In 2010, I received an invitation to play a concert with SouKast, Gui and Sou's duo. I had already enjoyed the duo in a performance in Denmark. Everything happened in the best way. We played rehearsed pieces and we improvised. From the beginning, my participation was done by my creation over the material they had already composed. In the recordings, the acoustic parts were played live in the studio with the MPCs of each of them, also played in real time. And then we created - Gui and I - some electronic sounds. The result is Sounds of Life. That allows us to follow creating, working and imagining, in a not so distant time, a better world - Benjamin Taubkin.